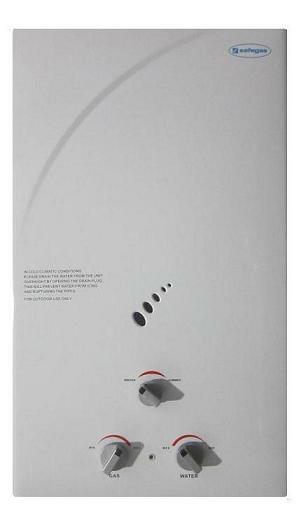 Gas water heaters have evolved over the years into safer, more efficient units. By doing away with pilot lights which would burn all day long wasting gas, modern day heaters feature electronic ignition and consume gas only when your water tap is engaged. A gas-on-demand solenoid valve releases gas to the burner only with the presence of water passing through, thus making them far safer. Adding to the safety features is a hot-water sensor and flame failure sensors, which monitor the functioning of the geyser and intervene if any of the required tolerances are breached. 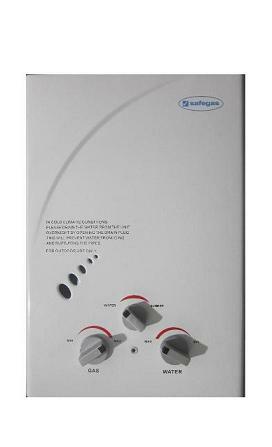 Our safegas gas water heaters are available in 6litre, 11litre, and 16litre per minute water flow rates. For the correct size to suit your application, feel free to contact us. We offer a 1 year carry-in warranty on our geysers. Our water heaters MUST be installed by LPGSASA qualified installers. Failure of this will result in the warranty being void. Water heaters used on installations with borehole/ rainwater must be fitted with filters to prevent silt build-up in the water sections. Damage by silt/ dirt build-up will not be covered under warranty. The rated minimum water pressure of 0.5bar must be met consistently for correct operation. These units are not suitable for use with single-lever water mixers. Our water heaters are TYPE D units which are suitable only for outdoor installation.